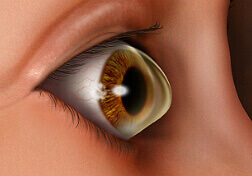 Keratoconus is a degenerative disease which causes the cornea to become thin and to change into a conical shape. The disease is progressive and can affect both eyes, not only causing a huge deterioration in vision but frequent fluctuations in prescription. Glasses eventually become unusable forcing patients to wear hard or gas permeable contact lenses which are not only costly but are often painful. Without treatment, Keratoconus can lead to a corneal transplant which is a serious procedure with high risks. A lot of patients with the disease are already on the NHS but they are often not informed about treatments that are available to halt the progression of the disease. Cross Linking and INTACS are two extremely effective non-surgical treatments that are safe and painless methods of stopping the progression of Keratoconus. At AVC, we provide both these treatments to help sufferers return back to normal life without the worry of losing their vision.